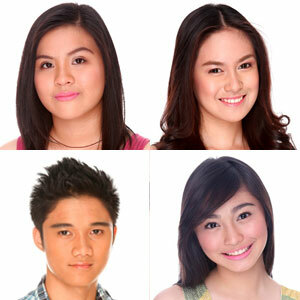 (From upper left, clockwise) Rebecca Chiongbian, Yen Santos, Tricia Santos and Eslove Briones are nominated for eviction this week in Pinoy Big Brother Teen Clash of 2010. A back-to-back eviction happened last Saturday (April 24) in the first eviction night of Pinoy Big Brother Teen Clash of 2010. Maichel Fideles, the Courageous Lakan of Samar, was forcibly evicted due to his disobedience to the house rules and Big Brother’s task while the Political Son of Dipolog, Romeo "Pots" Jalosjos III, received the lowest percentage of votes (5.53%) from the viewers. Escaping eviction were Angelo Pasco (15.16%), Patrick (16.63%), Eslove Briones (21.20%), and Tricia Santos, who got the highest percentage of votes amounting to 41.48%. Just a day after the eviction, the remaining 14 housemates underwent another grueling nomination night where Rebecca Chiongbian, Yen Santos, Eslove Briones, and Tricia Santos emerged with the most number of votes. Yen got six points due to her alleged lack of seriousness in tasks while Becca received nine points for sleeping too much inside the house. Villa housemates Eslove, who offended some of his housemates with his jokes, and Tricia, who was called "demanding" by her peers, got six and eight points, respectively. How will the four cope with their nomination, especially now that Big Brother will be merging the two houses? Find out from Mariel Rodriguez in PBB Teen Clash 2010 Uber, Toni Gonzaga in PBB Teen Clash of 2010 on Primetime Bida, and Bianca Gonzales in PBB Updates. Also catch PBB Raw Teen Clash of 2010 from Monday to Saturday, 11am on Studio 23.